I love this bed very much. It is gorgeoys! This sweet and simple panel bed is designed to create a light-hearted sleeping environment. The cottage style wood paneling enhances the chic white finish while dark oak trim lining accentuates the wood craftsmanship. Dimensions 88.25 In. X 67.5 In. X 60.0 In. 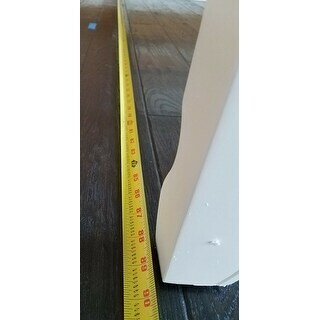 I purchased Cal King size of this bed and the dimensions in your website was mentioned for Cal king was: 60 inches high x 79.5 inches wide x 92.25 inches deep. The product which was delivered is not in that size. Now I am not sure how my mattress will fit in this unwanted size. The size after assemble is : 60 inches high x 78.25 inches wide x 89.5 inches deep . I am absolutely unhappy with the bed delivered and my biggest concern is how can I fit my new mattress here. "how much weight does it hold"